Four Accor Group hotels in Seoul, Sofitel Ambassador Seoul, Novotel Ambassador Gangnam, Novotel Ambassador Doksan and Ibis Seoul have designed various kinds of winter packages that encourage guests to check in and chill out for winter holidays. With various themes and programs, the packages are offered at marked-down rates for affordable yet luxurious winter holidays and will surely be the ideal destinations for unforgettable winter holidays. The package "Taste of Winter" features a Korean winter delicacy Dan-pat-jook (Red-bean gruel), free knee blanket and free DVD rental for your rest in a cozy guestroom. Also, free breakfast will be given to 2 children under 16 accompanied by their parents. Fitness center and swimming pool are open for free for family fun time. A free drink coupon for Live Music Bar "Gran*A" or Lobby Lounge is available with online reservation through www.ambatel.com/g. 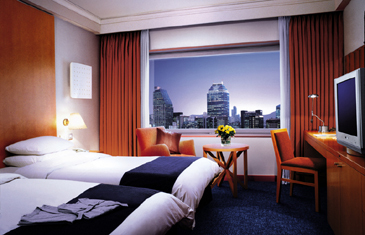 The package is priced at 140,000won or 170,000won per night from December 1, 2005 to February 28, 2006. One night at Business Floor/Free access to Fitness Center and Swimming pool/Breakfast at the bistro (2 persons)/Red-bean gruel (Room service)/Novotel Knee blanket/DVD player rental & free 1 DVD rental/Free access to Fitness center & swimming pool/10 percent discount on restaurants. "The Value Package" at Novotel Ambassador Doksan has been designed for a luxury & comfortable winter holiday trip by featuring Champaign & Fruit set at Superior Guestroom, unlimited draft beer at Live Entertainment Bar "Gran*A," free foot massage, free access to swimming pool and fitness club. A luxurious blanket and 2 free movie tickets will add another value to the special holiday stay away from home. The package is priced at 239,000won per night from Nov. 25, 2005 to March 7, 2006. One night stay at Superior Room/Free dining at any restaurant (Breakfast, lunch or dinner)/Free unlimited draft beer at Gran*A/Champaign & Fruit set in guestroom/Luxurious blanket (20,000Won worth)/2 free movie tickets at Primus cinema/Foot massage (2 persons)/Free access to fitness, sauna and swimming pool. Joyful Winter package at Sofitel Ambassador Seoul makes your winter most joyful ever with 3 choices of the package. A free shuttle to Chunggye stream is available for the hottest tour attraction in town. The Joyful Winter package 1 features one night stay at Standard Guestroom, free access to fitness club and swimming pool with 50 percent off on sauna. With the package 2, guests can stay at spacious Advantage Floor Guestroom and enjoy free breakfast. The package 3 adds a breakfast at Sofitel Club Lounge and Happy Hour service plus free tea set and sauna. Package 2 and 3 both include free access to fitness club and swimming pool and 20% off on restaurants. A late checkout is available upon guestroom availability. The package is priced at 99,000 won, 140,000won and 165,000 won for package 1, 2 and 3 respectively from Nov. 15, 2005 to Feb. 28, 2006. Ibis Seoul presents its special winter package "Winter Story at Ibis" for romantic winter holiday with someone nearest you from Dec. 2, 2005 to Feb. 26, 2006. The package has two options. The story one features one night stay with morning buffet for a couple and free parking. For movie lovers, The Story two adds 2 movie tickets. The package is offered at 69,000won and 79,000won respectively and will serve guests with the right value at unbelievably low prices. One night, Morning buffet (2 persons), Free parking, 2 free movie tickets at Mega Box. * All above packages are available only for local residents and with reservation.